Anjuna is a place synonymous with the hippie revolution of the 1960s, and even now, the place gives out the vibes. The hippies with their spartan and carefree life have receded into oblivion now, making way for the young modern hippies who will splurge for a laid-back, 'hippie' feel of Goa! This beach reminds you of everything Goa stands for in popular imagination - beaches, vibrant shacks, loud EDM music, cocktails and sea food paired with fantastic views of the sea in front and of course not to mention the weekend beach parties that take place in the shacks here. We had first gone there for a casual dinner date at Cafe Lilliput and were blown away by the ambience; Neatly arranged tables with candles facing the sea and a clear star-lit sky above! It was a bit sultry at that time of the season but the soothing sea breeze took care of that. As the night grew upon us, the music got louder too with a few people beginning to dancing on the beach. This is one of my earliest shack experiences at Anjuna and quite a memorable one but then discovered later, Anjuna has a lot more to offer. While Anjuna is home to some of the most happening shacks, it also boasts of quaint little cafes that treat you to great views of the sea. Also, the rugged terrain and cliffs on the other side of the beach lend a unique charm to Anjuna, making it a favorite photography spot for tourists. You can always find groups of young tourists posing away for selfies, balancing themselves on the slippery rocks. But then if you wish to take in the views from the cliff while enjoying a hot cuppa or a chilled beer, head to one of the many little cafes on the cliff near the parking. Another popular beach haunt here is the Curlies beach shack, situated on an extension of Anjuna beach, divided by a rock strip. Slightly less crowded than the main Anjuna beach, this part is great for swimming and surfing as well as some sun bathing. All the shacks on the beach offer decent food options from international to Indian fare though slightly pricey. If you are ordering any drinks or cocktails to relax and unwind at the beach, do go ahead. But if you specifically want to try out some good quality cocktails or mocktails avoid them at the shacks. This is from my personal experience because I have often found that many cocktails served on the beach taste quite diluted! The nearest place for great drinks and sea views would be purple martini, but will be expensive. The food at the shacks is also a bit pricey so for those on a shoe string budget, despair not. You will find hot and yumm omelette pavs, vegetable patties with buns and Maggie being sold on the beach till late night. 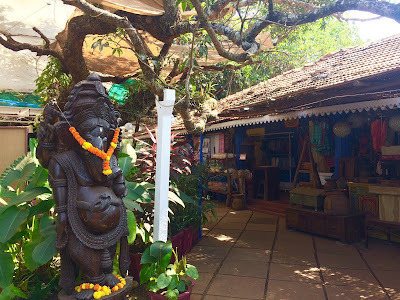 If you move away from the beach, Anjuna is home to lots of quirky cafes and restaurants. If you wish to holiday close by the beach, there are numerous beach side accommodations available for every budget. Though Anjuna today has come a long way from being the exclusive favorite for hippies and trance parties, you cant miss the essence. Cafe Lilliput and Guru bar are some of the popular ones. But If you prefer to party in a more sophisticated ambiance, then there is the NYEX club right at the parking place. We really enjoyed the great views and food here. But if you want that hippie feel, go shack-hopping along the beach! On the paths leading to the beach you will come across a lot of small stalls selling an eclectic mix of goods and knick-knacks, from beach clothing to colorful accessories and a huge selection of souvenirs of all kinds. If you aren't pleased enough with this, go for wednesday night bazaar at Anjuna and you will not be disappointed. Anjuna beach is 45kms from the airport and 22 kms from Panjim towards the north. I can see Anjuna right in front of me... nicely written ! Glad you did..Thank you Anju!